The next great open-source game has arrived. 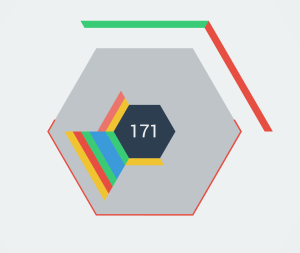 Earlier this year, the world was engrossed by 2048, an open-source puzzle game which attracted millions of players, and perhaps billions of games. Now comes the recently-created Hextris, a hexagonal version of the hit game Tetris. The premise is simple. Use your arrow keys to rotate a hexagon as lines of color fly at you. Line up consecutive lines of the same color, and earn points. Pile too many colorful tiles on without making same-color combos, and you’ll lose quickly. It’s interesting, it’s quick. and it’s going to go super-viral. So give it a try, before all of your friends get to it.